Home / Astronomy / NASA / Physics / Science / Boeing CEO Says They'll Beat Elon Musk's SpaceX to Mars. 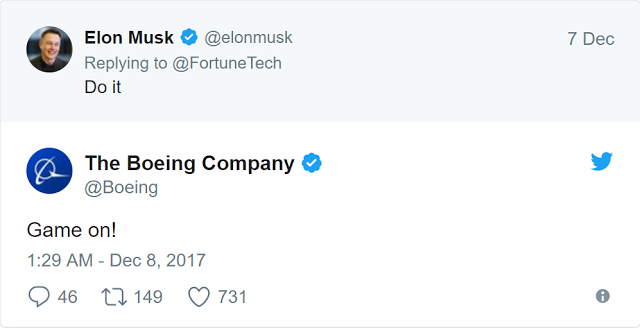 Musk Says "Do It"
Boeing CEO Says They'll Beat Elon Musk's SpaceX to Mars. Musk Says "Do It"
SpaceX CEO Elon Musk has thrown down a gauntlet to his equal at Boeing in the race to Mars, after the latter said they would be the first to get there. 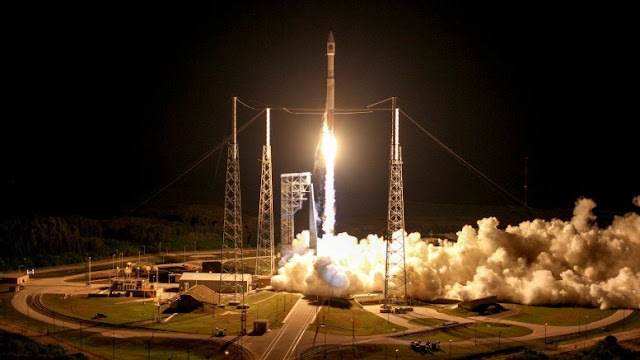 Speaking on CNBC on Thursday morning, as reported by Fortune, Boeing CEO Dennis Muilenburg said he thought his company would be the first to take humans to Mars, beating out rival SpaceX in the process. 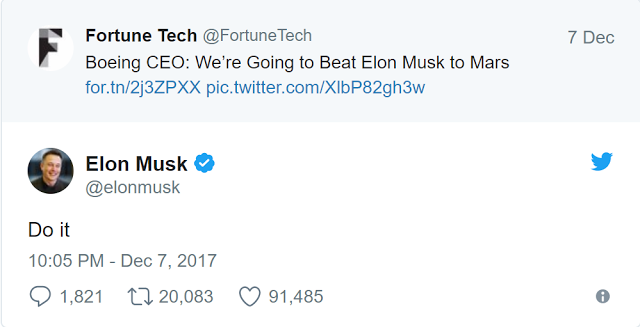 Musk, though, was having none of it. On Twitter, he had two simple words for the Boeing CEO: “Do it”. It’s an interesting state of affairs that we have at least two private companies in a race to Mars. There are others too, not least Lockheed Martin. Just in September this year Musk laid out how he plans to get there, unveiling what he calls the “Big F*cking Rocket” and suggesting that crewed flights could begin in the next decade. Boeing, meanwhile, is not developing its own rocket per se, but is instead working on NASA’s Space Launch System (SLS), which is expected to launch for the first time in the early 2020s. Both rockets are still being constructed, and it’s not clear yet which – if either – will actually get humans to Mars first. This isn’t the only arena SpaceX and Boeing are battling it out in, then. Both are currently racing to launch their new crewed spacecraft, Dragon and Starliner respectively, under contract with NASA. It looks like SpaceX is winning that race at this very moment, with a launch planned on its Falcon 9 rocket in August 2018. Boeing expects to launch its first crew on Starliner, aboard an Atlas V rocket, in late 2018 or early 2019. 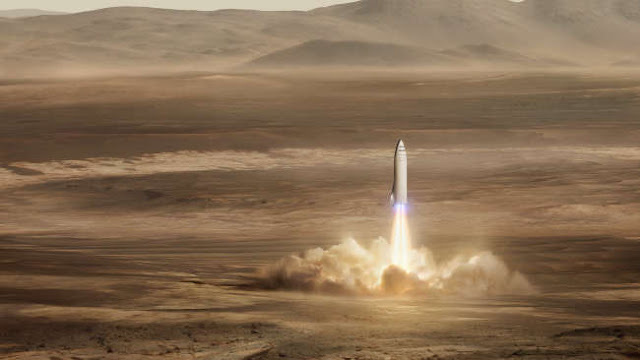 Muilenburg has made similar comments about Mars before, saying last year that he was “convinced that the first person to step foot on Mars will arrive there riding on a Boeing rocket”. And despite these latest comments, Musk has previously suggested that he doesn’t mind who gets there first, as long as someone does. “I think it's actually much better for the world if there are multiple companies or organizations building these interplanetary spacecraft,” he said in his talk at the International Astronautical Congress (IAC) last year. “You know, the more the better.” Or, you know, maybe he just doesn’t see Boeing as a serious threat.